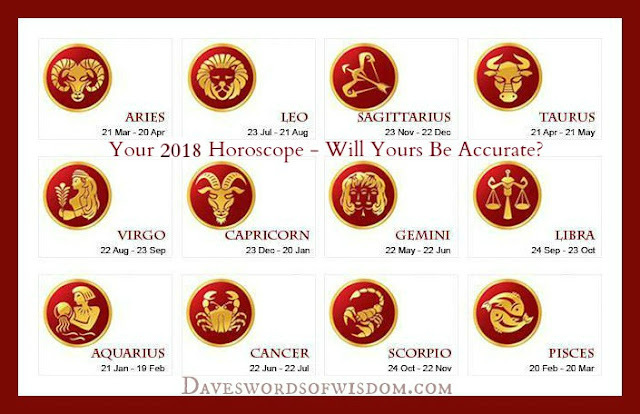 Daveswordsofwisdom.com: WOW - Could This Be The Most Accurate Horoscope of 2018? WOW - Could This Be The Most Accurate Horoscope of 2018? Despite the fact that the start of the year appears to be so professionally driven that it runs the risk of some major work/life balance issues, this is not nearly as daunting or as challenging as first impressions suggest. It has been 13 years since you last moved into the New Year with lucky Jupiter in your career sector and with your biggest year for professional growth and expansion stretching out until October and then support to bring things home in play through to December, you’re right to assume this is going to be a professionally focused year. However, it is also clear from the get go that this is an important year for home, family and/or property matters. How important is likely to take you by surprise, with some opportune developments continuing to unfold from late January through to early June. Even if there are no big changes during that time, home will be where the heart is and your home life or lifestyle will be especially important. Any work/life balance issues that came to a head late last year came from a standoff between planets that know just what’s possible on the home and professional fronts this year and are committed to finding the right balance from the get go. This doesn’t have to be an important year for home and family matters or for professional growth, with every reason why you should enjoy both. On paper, this doesn’t appear to be a particularly game changing year for either income or money matters, but with three of this year’s eclipses falling in your two money houses, it appears something is happening behind the scenes. Eclipses appear random and bring unexpected fateful developments, but they are in fact the tips of icebergs, with forces behind the scenes in play all along. With a lunar eclipse in your financial sector on the 11th February, a total solar eclipse on the 21st August and a lunar eclipse in your income sector on the 7th August, this should be an important year for both income and money matters. When eclipses are involved there is a natural current in play behind the scene, with a need to let both evolve naturally. With such an important professional year this bodes well for the money following, but on both the financial and professional fronts this will unfold naturally, making it all about the journey. Moving into the New Year with Venus in Aquarius is an advantage but not a rare one. What is rare is for her to have been here since early December or for Mars to have recently moved through. Venus will leave on the 3rd January and won’t return until 2019, yet while she will spend less than 72 hours of the year here, her influence on the year itself is massive. This allows you to begin the year with your heart engaged from the get go, a clear sense of what you want and also ready to embrace your passions. Even more important was the chance this gave Venus and therefore your heart, to connect with Jupiter in the final weeks of 2016, for he is the one planet that will have the biggest influence on the year itself. Jupiter will remain in your sector of adventure, travel, learning and discovery until the 10th October and when he returns to your career sector to begin your biggest professional year in over a decade, a sense of adventure will remain in safe hands through to December. Something has been awoken that you are unable to put back in the box, with simply going through the motions no longer an option and this is set to have an impact on all that you do. Whether it is making the most of the lucrative first four months of the year, the career developments later in the year or something special and fateful developing on the relationship front, this will bring a constant reminder that it is all about the journey. That there is something fateful developing on the relationship front is more a dark horse at first, with a lunar eclipse in your relationship sector on the 11th February suggesting that fate is at play, but without really knowing what. It might not be until midyear and until a total solar eclipse in your relationship sector on the 21st August that the hands of fate will be revealed. However, you don’t have two eclipses in your relationship sector, six months apart without them being linked and without fate being at play behind the scenes. This makes the extraordinary amount of time that Venus, planet of love and guardian of your relationships will spend in your communication sector this year make sense. Venus, planet of love and guardian of your relationships will usually spend between 24 to 26 days in your communication sector each year, on a mission to give your heart and your relationships a voice. With fate seemingly at work on the relationship front this week, this is something Venus must be aware of. To start with Venus will move through your communication sector from the 3rd February to the 3rd April, so will be here during the lunar eclipse in your relationship sector on the 11th August. However, she will then return for a double dip visit from the 28th April to the 6th June. The communication and relationship gods are working in unison, but to what ends they’re keeping under wraps for now. Moving into the New Year with Mars, planet of passion and the warrior planet of the cosmos in Pisces is a real bonus, ensuring that your passions are engaged from the get go, allowing you to move into the New Year feeling bold and fearless, ready to embrace the year from the get go. With Venus returning on the 3rd January, it won’t be long before your heart is engaged as well, together making January one of the best of the year, especially when it comes to following your heart and embracing your passions. It is the fact that they will both then turn their attention to making some money, that will make the financial tensions and pressure you may have moved into the year with make sense. While this is a big year for money matters as a whole and for financial growth, Venus and Mars are out to make sure that this is also an important time for income growth as well. While money matters as a whole are favoured throughout the year and to a degree income matters are as well, the most potentially lucrative months run from the 28th January to the 6th June. However, this year won’t just be about the money, though the fact that Saturn is spending this final year in your career sector will add weight to your income potential in the first half of the year. You will not only find it easier to balance things professionally, with Saturn favouring a slow and steady approach to making this final year count, from early May you will find that working smarter is a must, with some work tension or job pressure if you continue to work around the clock. Yet by working smarter, you’re likely to find that you not only last the distance, but you’re more likely to profit as well. While 2018 will eventually become an adventurous year, that won’t fully develop until the final three months. It is lucky Jupiter’s return to your sector of adventure, travel, learning and discovery on the 10th October that will kick off your most adventurous year in over a decade, a year that will stretch out to November 2018. What you will find this year is that you’re finally able to achieve a better work/life balance and a better balance between work and play. Things will feel a lot easier and in all this is going to be a good year for you. The main reason for that is the personal and/or relationship tensions of the last few years won’t follow you through. Yet in the process you’ve been left with a richer sense of what you want from your relationships and what they need from you. The early weeks of the year offer a chance to follow your heart and embrace your passions, with nothing seeming as urgent as it did in the closing weeks of 2017. While you will always move into the year wearing your professional hats, due to the fact that the Sun will always spend the first three weeks of January in your career sector each year, you shouldn’t find this too onerous this year. There is a lot of built up momentum that will ensure you have more than enough traction to get your professional year off the ground, but without the demands this has on other areas of your chart, namely your relationships. While January and February will be the best months of 2018 for friendship and relationship building, it is relationship building that will carry through and will only become stronger as the year progresses. Both personal and professional relationship building will remain the driving force throughout the year, but it is the first two and the final three months of the year that will be the most important. Another reason that you won’t be keen to see life become all work and no play, is the fact that there seems to be something special developing with matters of the heart and all things fun, playful, romantic and creative. While this is subtle, the fact that you have a lunar eclipse on the 11th February and a total solar eclipse on the 21st August, both in a fun, playful, romantic and creatively charged part of your chart, suggests something is going on. Eclipses are like the tips of icebergs and while they can present as unexpected and fateful developments, if you’re paying attention then there is always something in play, behind the scenes. With Saturn spending his third and final year in your sector of adventure, travel, learning and discovery, when taken as a whole 2018 is a year where there is enough professional momentum to keep the wheels turning, but this is a year for embracing your life head on. While money matters will become more important in the final months of the year, the main driving force in play this year suggests less work, more play, more travel and more time for matters of the heart and your relationships. While you are starting the year with a dream start as far as both work and career matters are concerned, making it clear that this is a powerful professional year from the get go, it won’t be as overwhelming as first impressions would suggest. With a lot playing out on the career front in the final months of 2017, much of what is already in motion or needs attention will play out in the first two months of the year. Lucky Jupiter, who will spend the majority of the year in your work sector, making 2018 your biggest year for job growth in over a decade, is playing a long game. Not due to leave until the 10th October and even then, with plenty of support to continue to bring things home right through to December, you’re running a marathon and not a sprint. Even Jupiter will spend from the 6th February to the 9th June in retrograde motion. Once the initial push to get this professional year up to speed is over, you will be able to pull back. So while first impressions suggest both a good and a busy professional year, the good part will continue, but the ‘busy’ part will drop off. While a major year for relationship building will begin with lucky Jupiter’s return to your relationship sector, that isn’t until the 10th October, giving you time throughout the year to explore what you want from your relationships and what they need from you. In the meantime, pay attention to a sense of adventure in play during the first six weeks of the year, for while it will taper off a little a sense of wanderlust, curiosity and adventure will run throughout the year. It is in December that this will start to take form, with the door opening to a three year period where travel, learning and discovery won’t just be something you talk about, with a chance to do something about it. In the meantime, this is a year when work/life balance will become a lot more important, with a chance to take a balanced approach to your home and professional lives, able to see both as equally important. There may also be some unexpected opportunities on the home, family and/or property fronts. Don’t be surprised if you find you lose your taste for operating in the fast lane from late January or that this will remain the case for much of the first half of the year. The more you appreciate the importance of balance, the harder it will be to buy into a rush mentality. While there is no doubt that you are spoilt for choice, moving into one of the luckiest year for love, matters of the heart and all things fun, playful, romantic and creative in over a decade, while also getting a dream start to your professional year, this does mean you will have to juggle a few balls. Fortunately these two very different forces aren’t in active competition, in that they are not competing on the same playing field and aren’t putting pressure on the other, making it easier to manage your time so that you can have it all. In fact, the belief that you can have it all is the priority from the get go, because unless you believe you can have it all your attempts to juggle and find a balance between work and play, will be half hearted at best. The reality is that you have a dream start to your professional year, with a chance in the early weeks of the year to throw yourself into the professional dreams, follow your heart and your passions before any need to get real. With support right through to the end of April and then plenty of momentum to keep the wheels turning, this isn’t just a big professional year for you, but for finally getting a chance to chase your professional dreams. All those things you may have had to put on hold, especially because of home and family demands, can now be chased. If you’ve had to make sacrifices in the past, this is finally your turn. Yet 2018 is also a lucky year for matters of the heart and all things fun, playful, romantic and creative, so chasing your professional dream can’t compromise that. Where you will really benefit this year, is where your professional dreams and passions involve anything creative. It is the fact that this professional wave is very much heart and dream driven, making it a lot easier to find a balance between work and play. However, expect life to get a lot busier when Jupiter returns to your work sector on the 10th October, ushering in your biggest year for job growth in over a decade. Yet again, it’s not just matters of the heart that will remain important all year, but your relationships. In fact, this is a huge year for personal and professional relationship building. As you move into the third and final year of a three year relationship boot camp, you’ve either overcome the challenges of the past or you’re already enjoying the benefits. This of course makes communication essential, making having the communication lines open in a real and authentic way an important New Year’s resolution. There will always be a chance to spread your wings and travel this year. Listen to what your heart is telling you in the early days of the year, make plans in the later part of January and into February, but expect to fly, literally or metaphorically, from early May onwards. Two major cosmic events take place in the final 12 days of 2017, events that in a nutshell sum up much of what you can expect and all that you need to know about 2018. As you open the door to 2018 and take your first look at the year and journey ahead, you’ll gain much by looking back at the previous 12 days. For the first time in 12 years you’re moving into the New Year with Jupiter in your home and family sector, making this a big, important and expansive year for home, family and/or property matters and from the get go this has to be a priority. Yet in the final 12 days of December Jupiter moved into opposition with Uranus in your career sector, bringing work/life balance tensions and issues to a head, something that will take weeks into the New Year to ease back. With work/life balance in your face from the get go and lucky Jupiter making this such an important year for home and family matters, you would think that this would have put professional forces in their place. Wrong. For it was over the exact same time that a major alliance between Saturn and Uranus unleashed some of the most powerful forces to come together on the job and career fronts in decades. In a nutshell, this sums up 2018 for you, a year of major career and job growth, something that will continue throughout the year, but will be off the chart during the first half of the year. Yet at the same time this is a huge year for home, family and/or property matters, with work/life balance an issue that will dog you throughout the year if you don’t take it seriously from the get go. The advantage this gives you, is that you have this year sussed from the get go, aware of the opportunities and the challenges and therefore how to solve them. 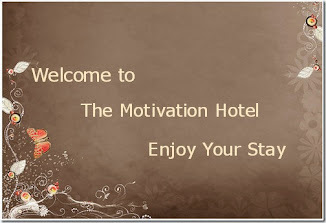 This will definitely be worth your while and you will benefit from any sacrifices or compromises you are forced to make. Jupiter is the planet of luck and expansion, so this is going to be a really good year for home, family and/or property matters and you don’t want, nor do you have to sacrifice that. However, this isn’t just a huge year for job and career matters, there are clues that this is likely to be a lucrative year as well. A lunar eclipse in your income sector on the 11th February and a total solar eclipse on the 21st August suggest there is hidden gold this year, for eclipses are only ever the tips of an iceberg, with much of the potential underneath the surface. With so much unfolding on the job and career fronts, that untapped income potential has plenty of support. From the get go get used to a balance between work and play, for with your luckiest year for love, matters of the heart and all things fun, playful, romantic and creative in over a decade beginning in October, there needs to be room in your life for this. While starting the year with Venus in your relationship sector is giving your relationships a boost from the get go, the fact that she’ll leave on the 3rd January and that your annual relationship review will be over by the end of February, suggests this is nothing but a good start. Knowing what you want from your relationships from the get go is obviously an advantage, but a lunar eclipse here on the 7th August suggests that fate is in play this year. Eclipses might appear random but they are not and like the tips of an iceberg, there real influence is taking place behind the surface. What this does encourage you to do from the get go, is to make the most of the fact that you have lucky Jupiter in your communication sector until the 10th October and then ongoing support from the communication gods right through to December. You might not know why it’s important to have the communication lines open, but you do need to make the most of the advantage this gives you. For at the same time that something fateful is building on the relationship front, there will also be a call to be true to yourself, with a chance this year to come into your own, able to take your own power back. This is going to expose any balance issues between your personal and relationship needs and if they do move into conflict, there could be some personal and/or relationship tension. Yet with the communication lines open, the scene is set for some major breakthroughs this year. What you will find from the get go is that life is not so busy and hectic, both compared to the early months of each year and the later months of 2017. It’s as though the professional gods are letting you off the hook, allowing you to cruise and focus more on keeping the wheels turning. In reality, your biggest, busiest and most potentially game changing three years on the work front ever, kicks off on the 20th December and won’t run its course until December 2020. While this will only impact the final 11 days of 2018 and will mainly play out over the course of 2019 and 2020, throughout the year this is something you are building and working towards. If the professional gods are letting you off the hook and allowing for a much quieter pace for much of the year, it is so you can get ready for what lies ahead. Despite the fact that there might be some financial tension or pressure in the air as you move into 2018, with that is likely to be a sense of determination, but also a better awareness of the importance and value of both money coming in and money going out. 2017 is without a doubt a lucky and lucrative year and with lucky Jupiter in your income sector until the 10th October, but his support crew staying on until December, that will remain the case throughout the year. Why then, if you’re moving into such a potentially lucrative year, with lucky Jupiter on your side for the first time in 12 years, should you be feeling under pressure? It was an opposition with Uranus over the holiday period in late 2017 that saw old financial beliefs, attitudes and assumptions challenged, in a way that may not have resulted in an actual financial breakthrough, not yet anyway, but resulted in a major paradigm shift in the way you look at money matters. For all their differences over the holiday period, it seems that the money gods have shorted things out, with money matters taking precedence in the first half of the year and income matters in the second half. Jupiter will spend from the 6th February to the 9th June in retrograde motion and while this will open the door to the past, second chances and untapped potential throughout that time, income matters will be happy to just tick over. With some of the best months of the year for money matters running from the 28th January to the 6th June, the money gods couldn’t be more cooperative if they tried. Yet it won’t be just about the money this year. The year will get off to a good start on the work front, but is not an overly busy year. However, a lunar eclipse in your relationship sector on the 7th August does suggest fate will play a role on the job front this year. What you will find in 2018 is just how important work/life balance is and how unwilling you are to carry the dramas and pressures of last year into the New Year. You’ll be happy to cruise professionally, so long as the money is there and last year’s personal and/or relationship tensions and challenges make way for some quality relationship building this year. Any pressure or drama you’re feeling at the start of the year is more a hangover from last year and once you move out from under the shadow of 2017 it will drop off. I wouldn’t be surprised if you wanted a refund, having been promised that 2017 would be your luckiest and most expansive year in over a decade, only to find that from Day 1 it feels like anything but. Chances are the final weeks of 2017 were stressful, putting pressure on your relationships and just generally feeling the kind of pressure you haven’t experienced before. However, before you protest rest assured, this won’t follow you into the New Year and if anything, this has already proved cathartic. The main problem was an opposition between Jupiter and Uranus, over in your relationship sector, with one thinking your needs should come first and the other that your relationships should come first. This is the first time this has happened here in eight decades and that it should happen just as you’re about to move into your biggest year for personal growth in over a decade, has to be seen as an opportunity for a major breakthrough. That is especially so as it was during that very time that a major alliance between the communication and relationship gods also peaked, giving you all the resources needed to turn this into an opportunity for a major breakthrough. Any tensions will drop off dramatically in the New Year, though January might be a busy month for you. It was developments that began on the home front in the final months of 2017 that need to be finalised, though these will be mainly sorted by early February at the latest. What is likely to take you by surprise is the almost dream start you have on the job front, how quickly things are set to take off and how much opportunity there is. A period of job growth began in the days leading up to Christmas but will extend right out to late April. This will make up for either the challenging or hard times on the work front over the last few years, with a lot more job growth and a lot less challenges. If this doesn’t bear immediate fruit it will do once Jupiter returns to your career sector on the 10th October, kicking off your luckiest year for income growth in over a decade, a year that will extend out to late 2019 too. In the meantime, something special is happening on the relationship front, putting the wakeup calls late last year into perspective. It is Venus and Mars, the planets of love and passion that are leading the charge into something special on the relationship front, during a period that begins on the 28th January and extends out to the 6th June. Throughout that time and right through to the 20th December, you will have the support of Saturn, in his third and final year in your communication sector. The start of 2018 is likely to have you in a quandary, for there is a greater than normal need for time out to hear yourself think, at a time when time is likely to be a precious commodity and will remain so for the majority of the year. It was work tension, job pressure or just the stress of juggling so many balls that ran the risk of a mini melt down in the later days of 2017, which was simply your body’s way of getting you to slow down. Yet as they say ‘time and tide waits for no man' and that is especially so this year, though to start with you do have a quiet patch in the early weeks of the year. You have until the 28th January before things start to take off on the work front, but once they do they will remain busy right through to early June. The lessons you’re able to move into the year with are not that you must cut down what you’re doing, for this has the potential to be an extremely opportune year for work and income matters, nor will a need for time to hear yourself think abate. What does have to change is how you work, with working smarter and not so much balancing your time, but prioritising it. If you’re going to be busy, then be busy doing the things you love, have a purpose and most importantly, give you a sense of job satisfaction and a sense of purpose. Trust that if you do, the money will follow, though it is less likely to if you stay at a job or work around the clock just for the money. In the lead up to lucky Jupiter’s return to Scorpio on the 10th October and the start of not only a year for major new beginnings, but the start of a new 12 year Jupiter cycle of expansion, time to hear yourself think will remain important, with a chance to close old doors. The one thing that you do have working for you in the early part of the year, is a chance to find a balance between work and play. While the busiest months of 2018 run from late January to early June, the most fun, playful, romantic and creative are already in play and will remain in play until late April. If you’re going to work smarter and maintain the right work/life balance, then a balance between work and play is a good place to start. These are lessons that, if learned in the early months of the year will serve you well throughout the year. The reality is you do need to work smarter, work/life balance is important, as is time to hear yourself think, but you also have a huge year for income, work and career opportunities. You can have it all, but a need for balance begins on Day 1. Since Saturn returned to Sagittarius in December 2014 you have been slowly taking your power back, which meant taking responsibility, taking ownership of your own life and facing consequences. It isn’t always easy having Saturn, hard taskmaster of the cosmos in your sign, but boy does this give you the power to move mountains if you have to. Due to leave on the 20th December and not return for another three decades, this is the year when you will get to enjoy the benefits of the past few years, with a chance to see where that sense of empowerment can take you and what you can do with it. This gives you the confidence to take on major new projects and challenges of your choosing, calling for some bold, but also some very personal resolutions from the get go. 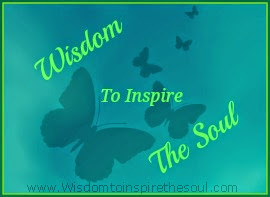 This is the thread that will run throughout the year and you can take with you into every aspect of your life. One thing that will be especially important in the first half of the year is matters of the heart and all things fun, playful, romantic and creative. This is something you may have had some wakeup calls about in the closing weeks of 2017, waking you up to what is important. To begin with it may simply feel like the tide has turned, but from last January through to early June you’ll be ready to throw yourself into following your heart and the things you’re passionate about. This makes this a big year for matters of the heart, but also for following your personal pursuits or hobbies, the things in life that are fun. When it comes to working yourself into the ground, you have been there and done that and are likely to have lost your taste for that. Just as well, because you have more than enough momentum. There are more than enough job opportunities, especially between March and July and plenty of career opportunities developing in the second half of the year, but not in the all or nothing way that they have been in the past. If 2016 and 2017 were mainly driven by your professional life and your personal life got what was left over, that does a complete flip this year. The first four months of 2018 are also especially good for home, family and/or property matters, with a chance to not only take care of any housekeeping, but to explore new projects or the things that excite you. This should see you finally achieve the work/life balance you’ve strived for in the past and the balance between work and play you didn’t even know you were after.